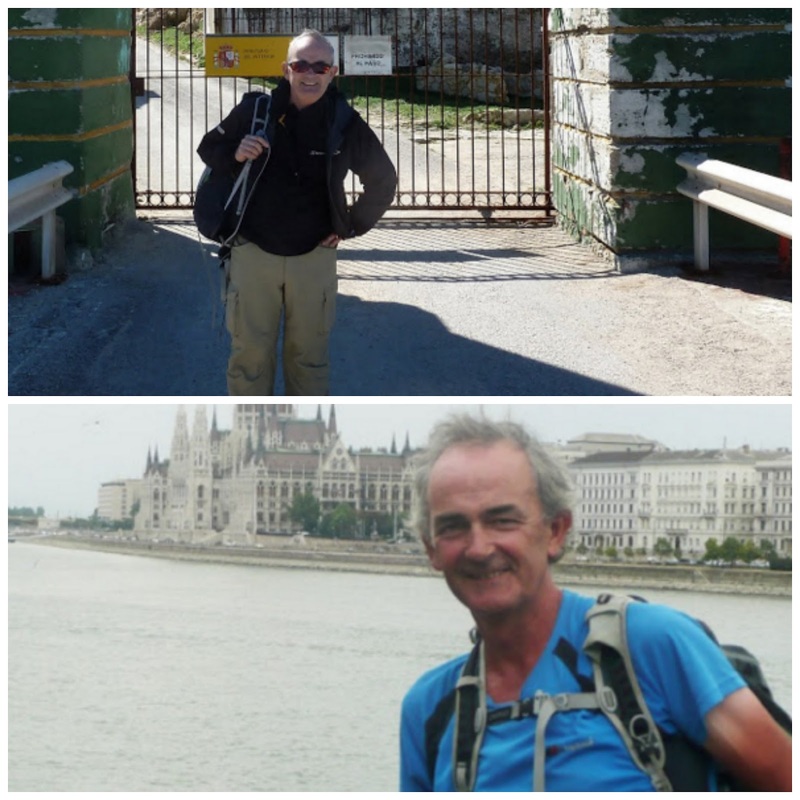 Although it's five years since I started on my trek across Europe on the E4 from Tarifa in Spain to Budapest I still get lots a questions about the journey. The most common and in some ways the hardest to answer is 'what route did you take?'. 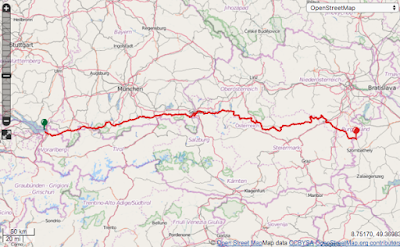 Although there is lots of information in the blog the route is not defined in a way a potential E4 walker could adopt. The reason of course is simple - I didn't plot it and given the number of times I went wrong, revealing the precise journey would be just a bit embarrassing. This blog will put that right and now, if you have six months to spare, you can follow my route (roughly) from the southernmost tip of Europe through to Hungary's beautiful capital. I say roughly because I've ironed out the mistakes I made and in one or two places improved the original route I took. Firstly a reminder of the route. The E4 includes a couple of important variants. In Spain you can follow the GR7 to the south of the Sierra Nevadas (in Andalucia) or to the north and when it comes to crossing the Alps you can take the high or low alpine routes. The high alpine route takes an extra month. I adopted a hybrid approach on the journey across the Alps. In western Austria I followed the low alpine route to Salzburg (the Maximillianweg), continued along it past the Austrian Lakes and then travelled south to the high alpine route. The official E4 (both variants) then makes a slightly weird journey up towards Vienna before heading south again to the Hungarian border crossing it near Kozeg. My route is more sensible and cuts this dogleg off. 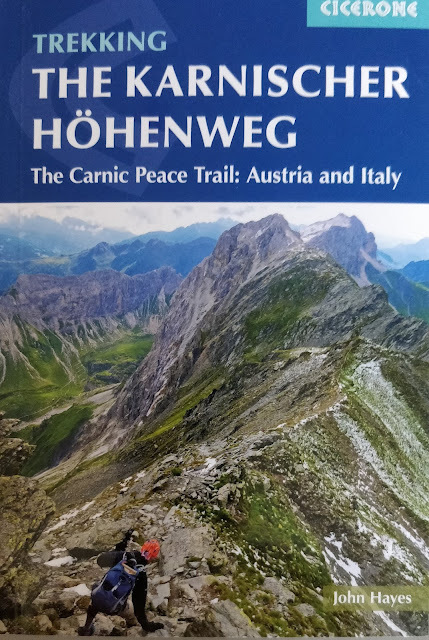 The E4 was definitely a great choice for a six month walk and if you want a long hike in Europe that includes alpine walking is I think the best option. The decisions I made when I put my trip together still stack up and the only slight regret I have is that I didn't take another month and do the high alpine option. It would have meant finishing in October but that would have worked weather wise. Alternatively, I could have stuck with my schedule and started a month later and spring would have been a little further on in Spain. Since I planned my original journey the amount of information available 'out there' on long distance walking routes has exploded. Six years ago it took me months to identify the route a task which I have just completed in a few hours. 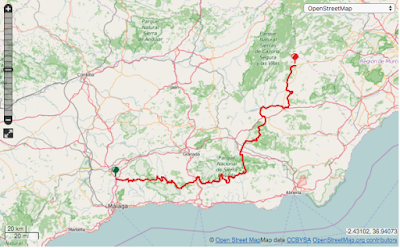 The route is based on just 2 sources - the openmaps route database and Manual Coranado Gil's page on Wikiloc. 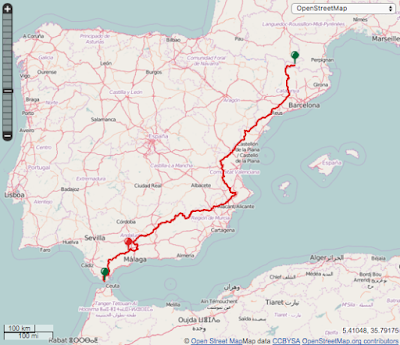 I used Manual's page to provide information on the E4 through France (although he has also walked most of the route through Spain) - information which is not yet available in one place on the open maps route database. The information is available, country by country, on my Viewranger page and these can be downloaded as gpx files and displayed on your own GPS app. Viewranger routes are generated from a limited number of waypoints and if you want a more detailed version go back to the original source. In Spain the E4 follows the GR7 until it reaches Catalonia. It then heads down to Tarragona from where it takes a fairly complex route to the Pyrenees. 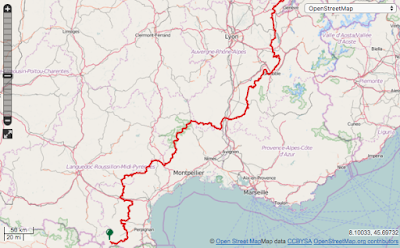 The route I followed in 2011 turned east to the coast even earlier, headed down to the mouth of the Ebro and followed an unpleasant coastal path north to Tarragona. Most of the advice I have had subsequently suggested that I should have stuck with the GR7 and that route is included on Viewranger. In Andalucia the GR7 and the E4 either goes around the Sierra Nevadas to the north or to the south. I walked the route to the north in 2011 but went back and did the southern variant later in the year. There are pros and cons to each route, but if you want dry weather take the southern route. The southern variant can be found on Viewranger here. 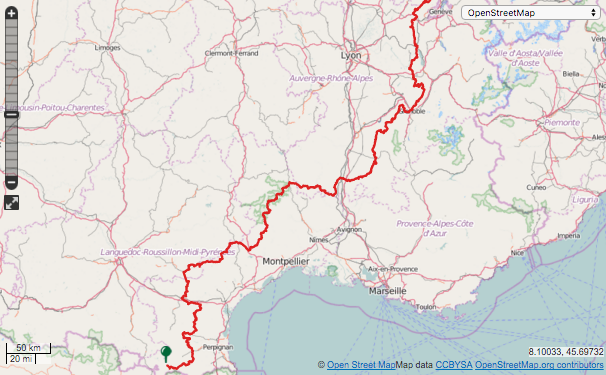 If you are a purist and want to stick with the official version of the E4 in Spain than the route is presented here. Highlights of the journey include Tarragona itself and Montserrat but these treats are paid for with a higher proportion of road walking than experienced on the rest of the route. After descending down the GR36 from the Pyrenees, the E4 follows bits of the French GR7 along the southern flank of Massif Central before heading north along the GR4 and crossing the Ardeche and the Rhone Valley. It then follows the GR9 up through the Vercors and the Jura before crossing into Switzerland north of Geneva. The Viewranger route can be found here. 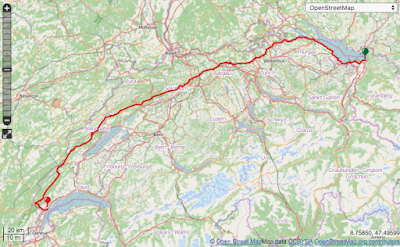 The E4 follows the Crestway, a route that links Geneva with Zurich (the world's first long distance trail) from the French border to the southern shore of Lake Constance. It then follows a well used cycle path along the lakeside all the way to Bregenz and into Austria. The Viewranger route can be found here. The E4 through Hungary follows the Blue Route, Hungary's No 1 long distance trail and a route that meanders its way across the country, border to border. It's easy walking, often fairly flat, through huge forests and wide open prairie like plains. My Viewranger route includes the whole of the Blue Route although dispite suggestions from Hungarian friends (I met so many people when I was there) I am still to complete the eastern section beyond Budapest. The Viewranger route can be found here. Great to hear from you, hope the sun is shining in Tarifa. How far are you going? Keep in touch! Hey there, actually it was quite dizzy today, but as I'm very sensitive to sun I'm okay with that :) I don't have any set goals distance wise, I just have time for about four weeks and will see how far my feet will take me. Glad to know you 'on board'! How do I keep in touch with you to know about your experiences? Beautiful mate! Thanks so much for posting this. I'd be interested in learning about the sorts of accommodation U used on your walk. Did you camp out? And roughly what should be a daily budget...€30 or €40/ day? Did U carry much? I didn't camp I'm afraid, I stayed in the whatever accommodation I could find (this determined how long each day was) and I could just about manage on 30 to 40 euros a day. Because I wasn't camping my kit, less water, came in at about 5 kilos, very comfortable. For most of the route you could easily wild camp and I know walkers who do it on a budget of 12. John, thank you 4 your reply. Gives me much more confidence now. It's just that first step to camp wild then all else fits into place. Dear John, great that you made it! And thank you very much for providing the routes via viewranger. I am planning to walk from Vienna to southern France on this route. Unfortunately it is not possible to download buyed routes from viewranger on a PC...! I would be very happy and grateful if you could provide me the detailed GPX-files of your journey in France (most important) and Swiss & Austria. I hope that this is possible for you. THANK YOU SO MUCH!